When it comes to Montestefano (pronounced MOHN-teh-STEH-fah-noh), one of the top crus in Barbaresco, you often hear the Langhetti say that the wine baroleggia. In other words, it resembles, evokes, or aspires to be Barolo-like in character. This microaggression against Barbaresco as an appellation is misguided and unwarranted in my opinion and experience: it would seem to imply (or one may infer from it) that Barbaresco is the inherently inferior among the two designations. 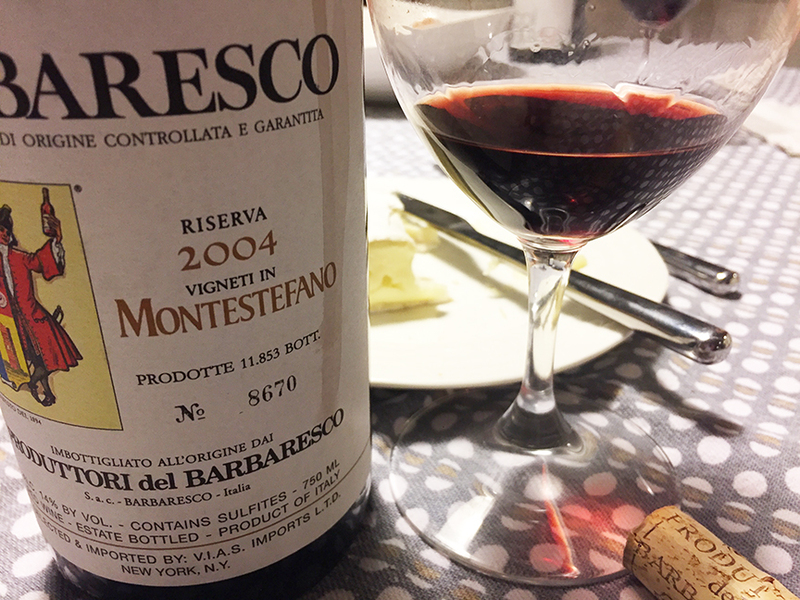 But there is a distinctive earthy and savory note that sets Montestefano apart from many of the other expressions of Barbaresco, which tend to be more lithe and less austere than their counterparts in Barolo to the south. The 2004 vintage is remembered by many as classical growing cycle, with an even and balanced progression of the seasons that some compare to the supreme 1989 harvest in Langhe. When we opened this bottle on Sunday night for a couple of special guests in our home, this 13-year-old wine guarded its fruit jealously, with rich tannin that only slowly began to reveal the wine’s gorgeous dark red fruit and umami flavors. The tannic character and the electric acidity in this wine make me believe that it has many years — even decades — ahead of it before it reaches maturity. What a wine, people! Earlier in the evening we also opened this bottle of Centesimino, a native grape of Faenza (Romagna), a variety I had never tasted before. According to ampelographic reports I could find, the vines used to make this wine are ungrafted. In other words, they are the descendants of plants that were not affected by the phllyoxera epidemic of the 19th century (because they were not impacted the louse, they were never grafted to phylloxera-resistant vitis labrusca from the New World). Evidently, the vines’ ancestors were cloistered in a palace courtyard in Faenza proper and were spared from the scourge. 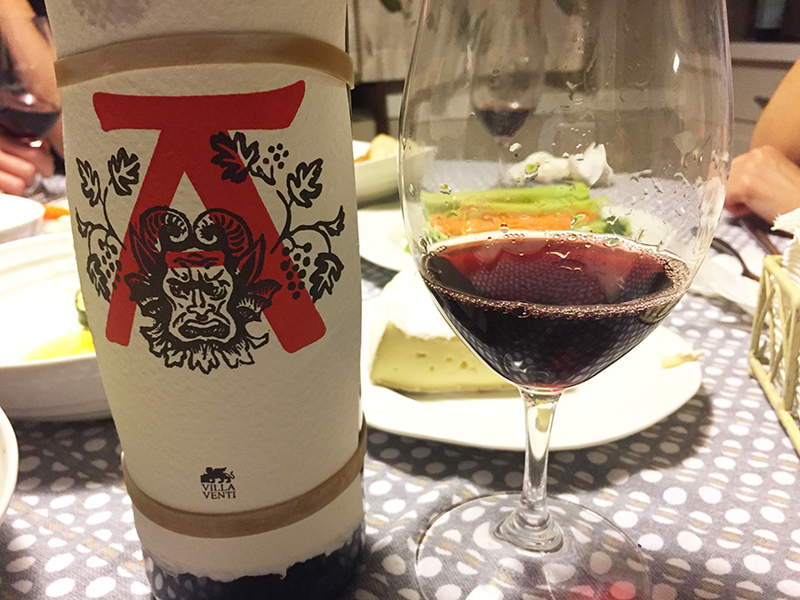 The “A” by Villa Venti, a rigorously natural winemaker (meaning organic farming practices, spontaneous fermentation, and minimal interventionism), was bright, with eye-popping berry fruit and zinging acidity in the mouth. We all enjoyed it immensely. The bottle that found its way to our home arrived clandestinely. But I hear that it might be making it to Texas via legitimate channels soon. A truly original and compelling wine and a reminder of the awe-inspiring breadth of Italian viticulture. A tree fell on our house early Monday morning! 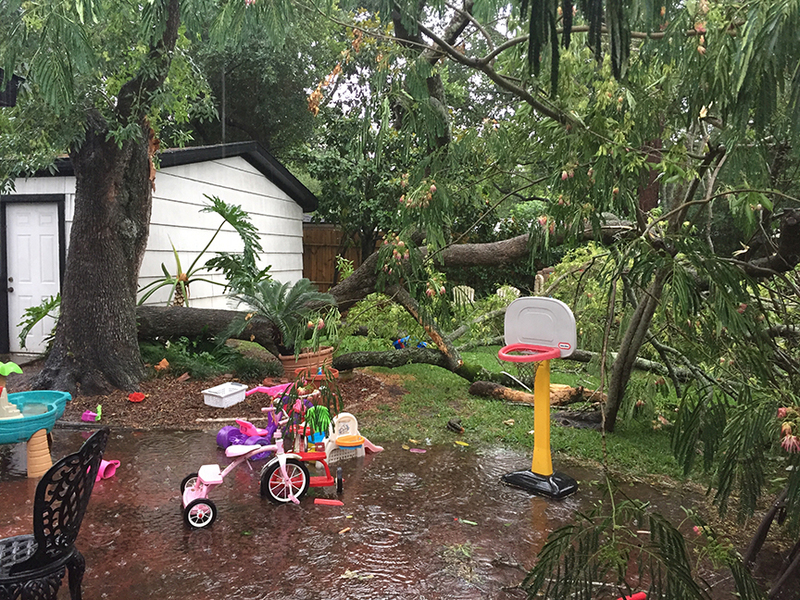 Intense winds on our street in southwest Houston brought down a number of old trees and caused havoc on our block, leaving nearly 200 homes without power. Miraculously, the damage to our roof was minimal and our landlords were swift to have the 25-year-old tree removed and the damage repaired. But, man, what a fright to wake up and find that this mighty trunk had fallen in our backyard! The funny thing was that no one in our family heard it fall: did it make a sound? 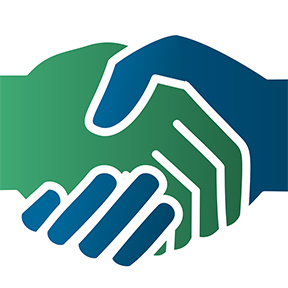 Thanks for all the well wishes. We are all safe and all is right in our home. 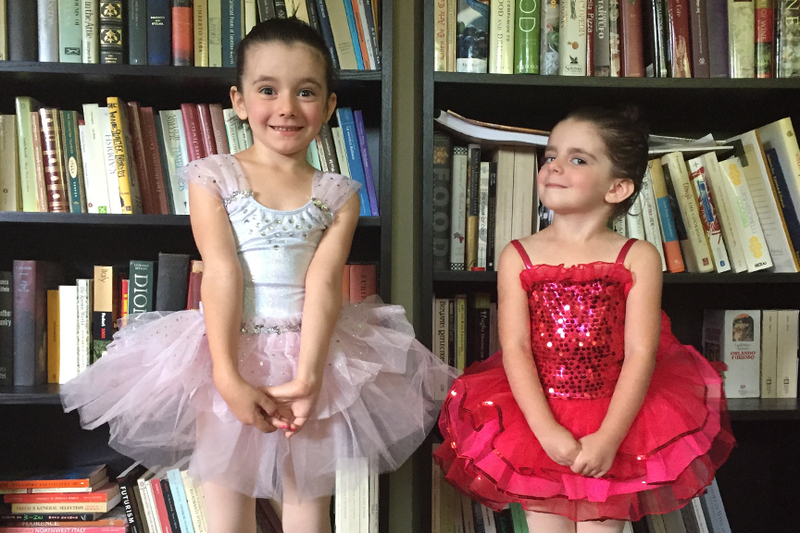 Georgia P (age 5) and Lila Jane (age 3) had their dance recital on Sunday afternoon. They both took the stage confidently and with gusto. And while their performances may not have been impeccable, the looks on their faces and glowing smiles that appeared when they saw me and Tracie P in the audience were priceless. They are my heart, my love, and my joy. I’m so blessed that Tracie gave them to us and I have so much fun being their dad. I had to laugh at your description of the Barbaresco. When it comes to Barbaresco, I tell my clients one does not drink a Barbaresco, one has an affair with it trying to get it to unveil its secrets.